Superfood Turkey Tacos a family favorite with an extra dose of veggies that you can’t see. 🙂 Ground turkey tacos sautéed with super tiny mushrooms, walnuts, and cauliflower rice to make a mostly plant based meaty meal. Place mushrooms and walnuts in a food processor and pulse until very small chop. In a large non stick skillet, sauté mushrooms, walnuts, cauliflower rice and garlic until soft. Remove from pan; set aside. In same pan, add turkey and cook until browned. Add veggies back to pan and mix into turkey. Stir in taco seasoning; add 1/4 cup water or broth to mixture, cook an additional 2-5 minutes. Serve in taco shells or on burrito bowls with rice, lettuce, avocado, cilantro, tomatoes, cheese, and salsa. 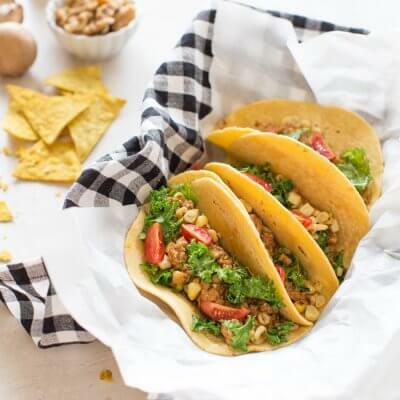 If you want to go completely veggie, I’ve even made these tacos with lentils instead of meat. Add fully cooked (yet slightly firm) lentils into the recipe instead of turkey at the turkey step in the directions.